Explanation: Watching and waiting, astronomers have uncovered the presence of more than 70 planets orbiting stars other than the Sun. So far almost all these extrasolar planets have crazy elongated orbits, lie uncomfortably close to their parent stars, or are found in bizarre, inhospitable systems. Yet a reported new planet discovery indicates for the first time that a nearby sun-like star, 47 Ursae Majoris (47 UMa), has at least two planets in nearly circular orbits more reminiscent of Jupiter and Saturn in our own familiar Solar System. The planets are too distant and faint to be photographed directly. Still, 13 years of spectroscopic observations of 47 UMa have revealed the wobbling signature of a second planet intertwined with one previously known. In this artist's illustration, the worlds of 47 UMa hang over the rugged volcanic landscape of a hypothetical moon. 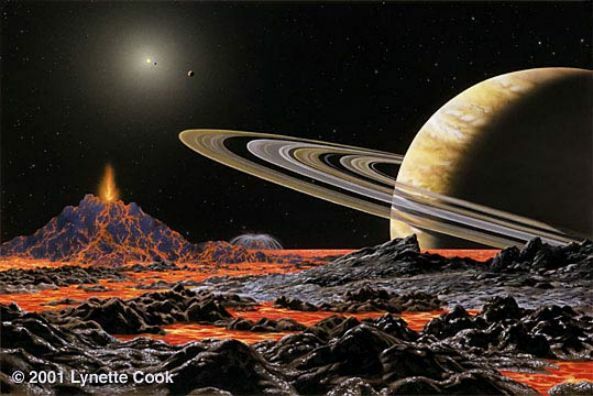 The moon orbits the newly discovered planet, imagined here with Saturn-like rings, while the previously known planet is visible as a tiny crescent, close to the yellowish star. Closer still to 47 UMa is another tiny dot, a hypothetical Earth-like water world. About 51 light-years distant, 47 UMa can be found in planet Earth's sky near the Big Dipper.